There are some romance series I read, no matter how predictable they are. They're also emotionally satisfying. Sherryl Woods' Chesapeake Shores novels are perfect examples. It's obvious early on which couple will end up together. The reader knows they'll face problems; the O'Brien family will interfere; the couple will end up together, and there will multiple Sunday dinners at the family matriarch's house. Willow Brook Road is another satisfying book in that series. Carrie Winters, granddaughter of Mick O'Brien, returned home from Paris. licking her wounds after leaving her PR job for a fashion designer when she realized the man was only using her, and wasn't interested in her romantically. Now, with the entire family hovering over her, she has to decide what her next move will be. Does she want to stay in the family community in Chesapeake Shores? If so, what will she do besides babysit for the young ones in the family? It's her concern for a child that brings her into Sam Winslow's orbit. He's the new web designer and tech expert for the local newspaper. But, he's also a struggling uncle who suddenly has guardianship for his six-year-old nephew. Carrie is angry when she observes a couple of Sam's decisions regarding Bobby. And, she's definitely an outspoken O'Brien who doesn't hesitate to give Sam a piece of her mind. Can Carrie face decisions about her career while dealing with a new man in her life? Is Sam ready to give up his life of adventure and wandering to settle in Chesapeake Shores, finding a possible future there? Readers of this series, or other romances, will know the answers are obvious. But, this series offers romance between two people struggling with life changes. And, there are usually other family problems in the books, including this one. Woods' books are successful because of the romance, the strong characters, and the family support. In times of trouble, the O'Briens know they can count on family. "Families were supposed to stick together in times of crisis, even when the person pushed them away." And, this isn't a series about successful men and the women staying home. There may be a number of happy marriages, and numerous children, but successful women are the contented women in this series. Those women are stockbrokers, and inn owners, and bankers, and bookstore owners. It goes on and on. And, the women recognize it. "Our family is crawling with wonderful role models who exemplify the importance of romance." But, Woods never hesitates to show the problems ordinary people deal with in regular life - divorces, the inability to have children, cancer, family fights, depression. Readers turn to romances because of the "Happily-Ever-After". In the case of Sherryl Woods' books, including Willow Brook Road, the romances lead to satisfying stories. 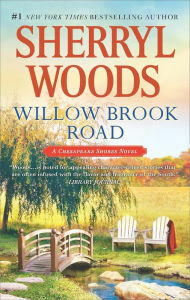 Willow Brook Road by Sherryl Woods. MIRA. 2015. ISBN 9780778318262 (hardcover), 344p.